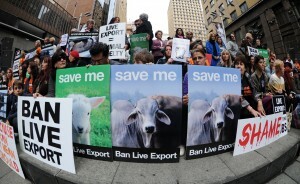 Thousands of people joined protests in capital cities over the weekend to urge the Australian Parliament to ban live export in Australia. The rallies follow a lift on a temporary ban put in place after footage of the mistreatment of cattle in Indonesian abattoirs was aired on ABC’s Four Corners program. Animals Australia advocate and RSPCA cruelty investigator Lyn White has called on the Prime Minister to let MPs have a conscience vote when the two bills which oppose live animal exports go before the House of Representatives this week.